Fremont Older Open Space Preserve is one of the smaller preserves in the constellation of the Midpeninsula Regional Open Space District. It provides enough riding opportunities to be a decent option for riders who live in the vicinity, but not enough to make it a mountain biking destination for anyone else. Nor are there any must-see features that I can think of. The park does offer some singletrack options, but most trails are fire roads. The main singletrack options are parts of Seven Springs Loop Trail (mainly its "southern half") and, to some extent, Toyon Trail. While most trails in the park are open to bikes, there are a couple that are not. So, follow the signs or examine the park map carefully. There are two widely separated ways of reaching the park for biking. One is via Stevens Canyon Road near the Stevens Creek Reservoir, from the west; the other is via Prospect Road, from the east. (There are other entrances, but with less generous parking opportunities.) If you enter the park from the west, you'll have a good chunk of a fire-road climb awaiting you (700 feet), so you'll have to work to earn your way in. Entering it from the east involves less of a challenge before some of the fun begins. The route represented on this page starts from the Prospect Road entrance of the park. You might want to stay on the part of the small parking lot that's the farthest from the adjacent golf course; there's more than a negligible possibility that a golf ball might otherwise land on your car. The short-but-sweet singletrack Cora Older Trail takes you into the park and to your first fire road, which doesn't last very long before you start your next singletrack of the ride, and possibly the best one here: Seven Springs Loop. This has you first descending, and then (once you cross Ranch Road) climbing. Hayfield Trail will connect you to the other "lobe" of the park. (That's the only trail that connects the two halves.) You'll then face some of the steepest short bursts of fire-road climbs in this park before you reach Coyote Ridge Trail. That trail takes you to the edge of the park, at which you start back on the Toyon Trail singletrack. 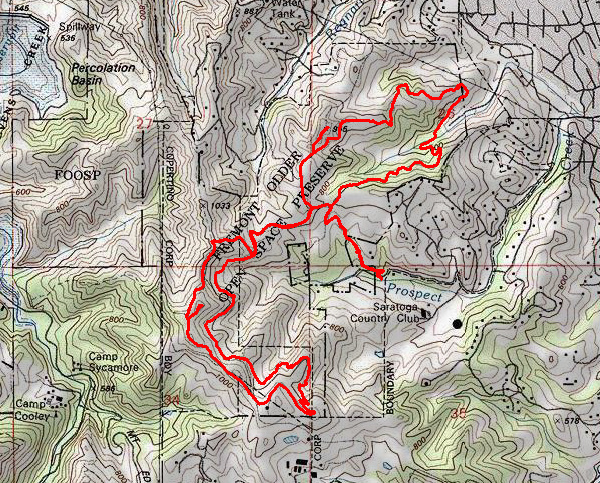 It's debatable whether Toyon is a singletrack or just a fire road narrowed by vegetation, but never mind that. Toyon is not as evenly graded as Seven Springs. It actually dips sharply and then throws a couple of steep climbs at you. Personally, I can never clear the steeper one (in the direction implied by the route on this page). Along the way, you might want to take the short side trips to the two hill-top vista points (Hunters Point and Maisie's Peak) in order to take in some of the local views. These are also reflected on the route plot. Keep in mind that Toyon Trail at Fremont Older (which is included in this route) is subject to seasonal closures. Be sure to check the park website before planning to ride that trail during rainy months. There seems to be a pack of coyotes living within (or near) this park. So don't be surprised if you come across one of their "family members" or hear their yapping nearby.